Sea kayaking opens up a whole world of exploration. It's an exciting way to enjoy the beauty of America's coastal regions. In Sea Kayaking along the Mid-Atlantic Coast, veteran paddler Tamsin Venn has selected 30 of the best sea kayaking trips along the mid-Atlantic shoreline. 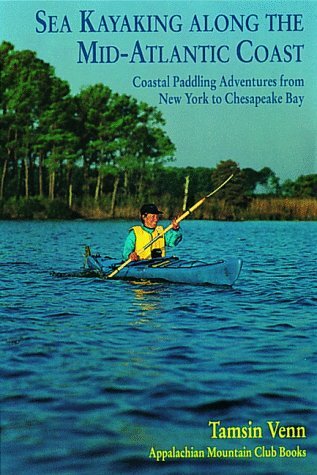 From a circumnavigation of Manhattan to a paddle around a wildlife refuge on the Virginia shore, you will find in these pages all you need to know to set off on a sea kayaking adventure, including detailed, descriptive accounts of 30 routes, with local history, wildlife, ecology, scenic highlights, and more; maps and NOAA chart references; a section called Getting There, which includes access, parking and launch and landing spot information; trip mileages; relevant harbor information, land-use permissions and campsites; and tidal ranges, currents caution areas, weather, equipment and safety tips. Drawing on years of in-depth experience, Sea Kayaking along the Mid-Atlantic Coast is essential reading for beginners and experienced kayakers alike. Tamsin Venn is editor of Atlantic Coastal Kayaker. A longtime outdoor and travel writer, she is also author of Sea Kayaking along the New England Coast, published by Appalachian Mountain Club Books and available through Globe Pequot.